What better on Good Friday than combine a pilgrimage, a ridge walk and a visit to the West. Got details from wicklore's track and started at L95090 80949 A where we parked on the roadside outside a house. The weather was changeable but dry having just rained. Headed up towards Croagh Patrick Far East Top. The cloud base rose to allow lovely views out over Clew Bay. On the way to Croagh Patrick East Top the powers that be took back the view! We plodded along to join the track up from the main car-park. and joined the last of the pilgrims making their way to the top of Croagh Patrick. Some people think they will be impervious to the weather. The range of unsuitable clothing was amazing. 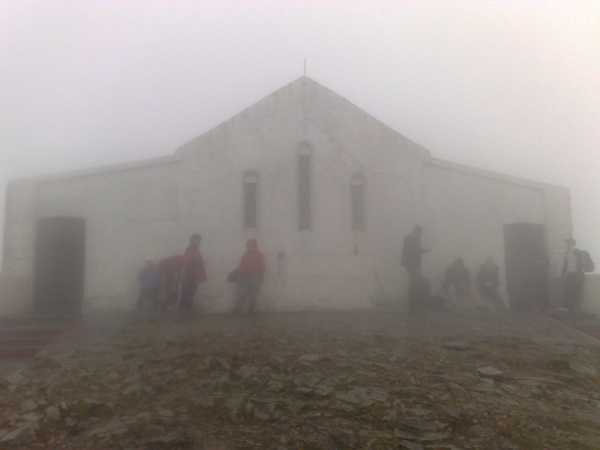 Close to the summit, the weather deteriorated and the picture at the summit was not taken with a Vaseline coated lens ... but an example of the prevailing conditions as we sheltered in the lee of the Chapel.